These two superb curvicaules have been catching my eye since 1993. I purchased 44 legally collected plants from a nursery at Eungella. As they each flowered out that were either kept or given the chop. The King and Queen were exceptionally fine examples of curvicaule. Both have tremendously thick segments and wonderful shape and arrangement. Both are deep cream foxtails. Your chance to get some of the royal offsprings. There are more high awards in this curvicaule speciosum then on the chest of the average South American Army General. So far as I know, Crediton Cream, with its AM award, has not been used much at all in speciosum crosses. I do not think there is an awful lot of it around but it is a fine curvicaule for certain. I have crossed it with the famous Daylight Moon with its highest possible award of FCC. How could it fail to impress? Both are beautiful open cream flowers with not a fault between them. Rock Pile hardly needs any introduction. I picked it up from the remains of a land slip at Kroombit Tops in 1994, Almost dead, it had one very limp raceme on board but the couple of blooms left were so deep in yellow colour I claimed it. Good job I did. Fabulous! 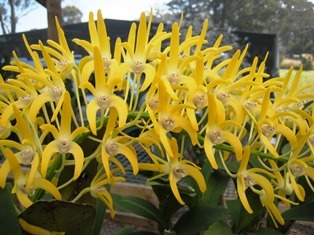 Mountain Gold is another very deep coloured one that I flowered from a wild seedling. A very fine one in all respects, particularly shape. First time I’ve used it and I expect big results. Camp Creek I place in the top 5 of my all-time favourite grandiflorums. It has been a Show Champion for me 3 times. Colour is spectacular but so are all its attributes. It has no faults and shows off a particularly fine upright arching habit of raceme which displays brilliantly. Matched with Rock Pile, another top 5 member, I can only say that the world is waiting for this one . . . must be a champion possibility. Camp Creek is described above in cross 404. I Can only repeat that you should look at it in the Parents Pics section of the Web Page. Stunning! Creek Aureum I came across in 1992. It is probably the most used grandiflorum in my breeding program. 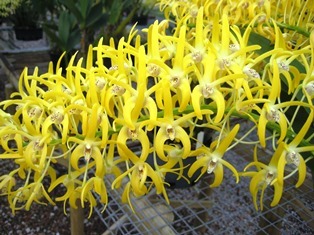 It has the advantage of having less robust pseudobulbs then most grandiflorums. See the pics. Must be a great result. Both have terrific deep colour plus shape to burn. Valencia is a full brother to the famous Katrina (the darkest of all grandiflorums so far). It came from the same parentage and seed capsule. I was given half of an unflowered seedling a few years ago and when it did flower I was blown away. It is damn near as dark as the famous one. Just a few flowers on it and no photo sorry. I just had to use it and Camp Creek was such an obvious choice. I have used it elsewhere in the catalogue as well. Colour!!! Oh Sugar! Is a great find from 1994 and it got its name from the bad language used by the 3 people present when it was discovered. Had to change that word to a nicer one! 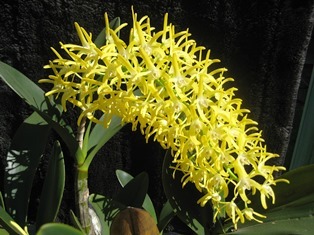 Very popular with speciosum growers ever since because of its size and colour. Just splendid indeed and there are pics in the web page if you look. Matched here with the mighty Camp Creek and must be good. It is worth mentioning that both mother plants were killed by the vast fires of 1997. Living on here. Breakaway was found in 2005 in the Calliope Range, not sure whose find. My piece took 6 years to grow roots and flower properly. The words I wrote in my little red book were: STUNNING! Has made it to the top shelf! Breed it! Breed it I have. It has it all with colour, shape size and arrangement. It is crossed in this one with the very dark and shapely Rock Pile, the one to beat. Wow is all I can think of. I have blown the praises of these two long and hard in crosses 406 and 408. Valencia really is a very dark colour and in the pursuit of darker and darker grandiflroums it just has to be included in the arsenal. Breakaway has become an overnight sensation after sitting around building up its power and appeal for 9 years. Absolutely is now a member of the A Team of my top breeding plants. It has the shape and the size and the charisma to match. Here is another contender for the most likely to succeed award. See 406, 408 and 409. Breakaway was just so impressive when it sprung onto the world. 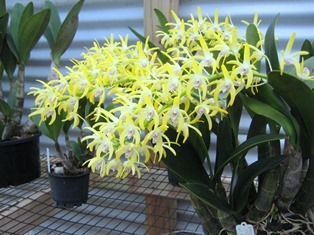 I had never used it before its most successful blooming in the 2013 season. Not often a new breeder has had such a sudden impact on my senses. Camp Creek you are no doubt sick of hearing me glorify. I cannot help it . . . simply irresistible to quote the song! Blizzard was found on the NSW Central Coast many years ago. As white as white can be and on a long, high arching raceme to boot. It displays the beautifully shaped flowers to perfection. At an open day I had in 2013 I was badgered by 3 growers to get a piece. White Magic is just that. It might take black magic to design such a speciosum! From the same region as Blizzard I believe, they may well be out of the same seed pod. Simply magical and its about time some new parents entered the var. speciosum white blood lines. What we have here is an attempt to produce the most perfectly shaped and deepest coloured speciosum. That is why this inter-varietal cross, representing 3 different varieties, was thought worthy of my attention. Eldorado is an exceptionally fine crossing of Mt Larcom Gold x Windermere. Many of these are around the traps but this one is so superior to any other. You have to check out the pics in the Gallery. FCC quality absolutely! Golden Fox is a most superior deep gold var. blackdownense. See the pics. The advantage is the stumpier, short bulbs and the perfectly crowded foxtail habit of raceme coming from the var. blackdownense Golden Fox. So Good! Do not miss it! For all the reasons I gave in cross 412 above, so too is this one chasing the same goal. This time it is Eldorado crossed with the famous manmade grandiflorum Katrina AD. Katrina is the darkest so far known. Eldorado (Windermere x Mt Larcom Gold), is very dark and unchallengeable with regards to shape and colour and also its fabulous habit of raceme. This cross has two doses of var. grandiflorum and one of var. speciosum with the Windermere. Must be a chance of deep orange flowers here. Lyrebird is the ants pants of the four known variety speciosum albinos. It is absolutely snow white without a single spot on it. It is whiter than white! All the other features like shape and size etc. are tops too. Hedow Albino is just that: the only known albino var. capricornicum. Carpricornicums are very unusual in that they can flower any time from April through to September. 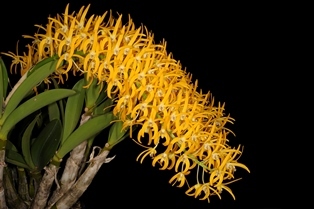 It is not uncommon to find a few in full bloom in June and July. They have a long peduncle and a long raceme. I thought it would be interesting to see what happens when crossed with the mighty Lyrebird. Hopefully it will set up a whole new era of winter flowering speciosums in snow whites. Lyrebird is the stunner of the four known variety speciosum albinos. It is absolutely snow white . It is whiter than white! All the other features like shape and size etc. are tops too. Albino Hillii is just that; a completely albino var. hillii from the Little Manning River area in the late 1970s. It has a HCC and an AD from ANOS. When in full bloom it is truly one of the great speciosums. Very long racemes with hundreds of snowy white small blooms crowded like a foxes tail, but not so crowded that they are a mess. The result I hope for here is the same foxtail affect but with much larger flowers. And there will be albinos amongst these progeny. I did not agonise over naming any speciosum as much as I did over this one. Nothing was good enough. Got a lightning bolt thought one day and called it My Prayer. It is startling how good this one from the NSW Central Coast really is. Others who saw it agreed. The pics tell the story. I decided that there was only one other var. speciosum that equalled the beautiful arrangement and style of My Prayer. That was the famous National White. They are very similar but differ in colour. My Prayer is a cream foxtail. National White is a white foxtail. So I crossed them. I am expecting something very special with this one. Here is a strange one I hear you cry out! The charm of var. hillii is hundreds of flowers arranged thickly into a fox tail. Alas they are small, but so what? 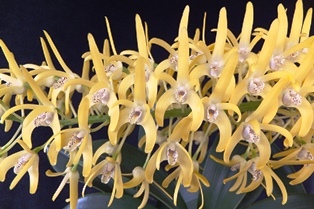 This awarded albino one is perhaps one of the finest speciosums there is. Certainly the finest hillii. Being an albino it should let the colour of anything matched with it to come through. 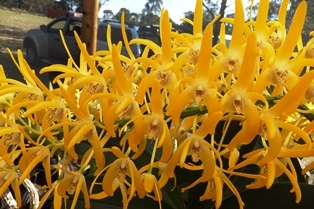 These the words of Sid Batchelor of Yondi Orchids. So imagine what might happen if nearly the finest grandiflorum in Rock Pile, with its deep colour, and superb shape, is crossed with it. I hope for long foxtails of deep yellow blooms but arranged like a hilli with tightly packed blooms and slightly larger flowers. I reckon it will work!!! Long term readers of these pages will know that I believe there is a very big future to be had with genes of var. blackdownense. This almost unknown variety has many fine attributes. Chief among them is its amazing habit of raceme. Have a look at page one of this website for example. Also the best of them are as deep a gold yellow colour as the best grandiflorums. 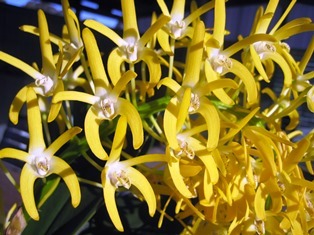 Shape is superb as well and all this on quite short bulbs which saves an enormous volume of space. Golden Fox is nearly the best of them and it is matched here with the very deep coloured Bottlebrush which has an AM award. See the pics and judge for yourself. Dont be a mug: get in on the ground floor! The big future for speciosum is in Blackdownense folks. Blackdown Baron is a superb foxtail deep yellow example. A fine shape and heavy texture to boot. A long raceme as well. Below Falls is not a glamourous name but it represents something wonderful to me. Look at the pic. Not as deep in colour as some but the arrangement and shape, with the habit of raceme, plus the size which is great for this uncommonly seen variety of speciosum. I cannot help but think that this one is a super crossing of speciosum and all on quite short, compact bulbs. The great names involved in this creation are proclaiming yet another quest to create the worlds darkest yellow orange gold speciosum. Golden Fox is a particularly good var. blackdownense and with its great arrangement and fabulous colour, all on stumpy bulbs, I think I will be rewarded in the future. Matched here with Rock Pile, the legendary grandiflorum, the result must surely end up spectacular. The real hope is that the seedlings will result in shorter, more manageable sized bulbs. It will work I reckon. Fort Knox is possibly the best grandiflorum in the world. But bad luck haunted me in the spring of 2013. I only got one raceme come out on my 4 plants. And something got to it, resulting in me only obtaining 3 flowers. I selfed two of them and that failed. So I took the pollen from Valencia and made Fort Knox pregnant. Valencia is a full brother to the famous Katrina (darkest of all). It is nearly as dark! The seedlings are growing fast and it looks like being a very vigorous creation. Looking for the deep colours again but with the absolute best in habit of raceme. I hope Fort Knox blooms this year, there is work to be done! You have never heard of Purple Lips. It has the most extensive, intense deep purple spotting on the labellum. More than on any variety of speciosum I have ever seen. It is an utter focal point when you look at the flower. 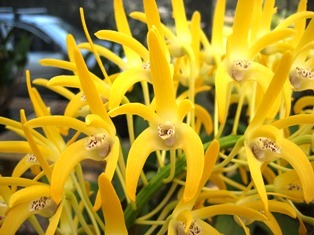 When combined with the lovely yellow colour of grandiflorum then it is stunning to behold. Here I have crossed it with Creek Aureum in an effort to get even deeper colour into the whole flower. Hopefully the offspring will pick up the heavy and intense purple spotting as well. I have a mental image of the result and I trust it will come good . . . it cannot disappoint! Not everyone wants just big gold speciosums. A lot of you chase the snow whites. So I make a few of them too. This one was begging to be born for a good while. But they have to flower in the same year and that can be an issue. Here at last is a ripper in the making. Lyrebird is the most desirable of the Albino speciosums. National White has been hanging around now since the 1970s. I and others still place it in the top five wild clones ever found. It is just plain wonderful. 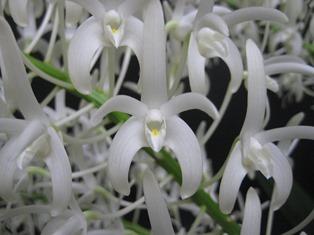 Long upright racemes of superbly arranged rows of faultlessly shaped blooms in absolute white. Cannot fail this one. Rock Pile!! Are you sick of reading about it yet? But it really is almost the ultimate grandiflorum. It demands to be used and so I cannot ignore the call. Crossed here with Valencia which is a man made grandiflorum. That is, Beranghi Gold x Creek Aureum. 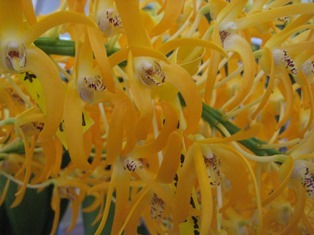 It is nearly as dark a yellow-gold as its famous sibling in Katrina. Now, if you mix up the genes of these three most famous speciosums, the chances are you going to end up with a pretty good Rock Lily. Katrina is a seedling from Beranghi Gold x Creek Aureum. It is the darkest known speciosum so far. I have wondered for a while what might happen if it was to be crossed back to one of the parents. In this case I used Creek Aureum. So this one is 66% Creek Aureum and 33% Beranghi Gold. Do not laugh this one away as it may be a new door just begging to be opened. It is difficult to see how it could be anything but good. You have not heard of The Virgin before. It is the third Albino var. speciosum. 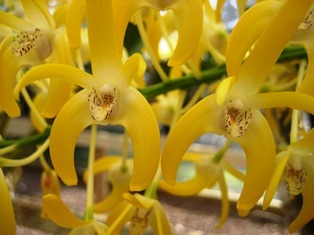 I have not used it simply because it was not out at the same flowering period as the others. Just as good as the other Albinos and here it is now crossed with the famous Lyrebird. The Virgin looks very different. It has a smaller flower but they stand at the end of very long pedicels. This causes the raceme to be very wide, almost 150mm across like a giant feather duster. The flowers are packed on as well. I will be waiting to see how it performs with great anticipation. Another mating of stunning grandiflorums. The pics tell the story. I have admired them both each year since and thought it time to give them their own star on the sidewalk. Breakaway is my really big hope and Sunburst has such wonderful colour. It really deserves the regal name we gave to it. Both have wonderful shape. No crossed over legs, or lateral sepals, in my stables I can promise you! Grandisaurus is just that: GRAND! Hellishlly good shape, very wide spreading lateral sepals and solid texture. Naturally the arrangement, colour and habit are there as well. 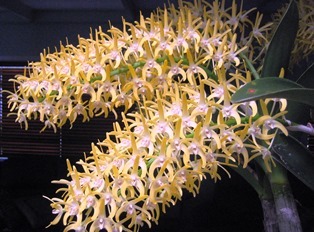 Also, it is very large grower with bulbs up over 700mms when at it best. Robust in all facets. Grandisaurus seemed an obvious name to me. Ingot has the largest flowers I have seen on a grandiflorum, coming in at 107mms. And it was not stretched between two trucks either. Good shape and colour as you can see in the pic below. 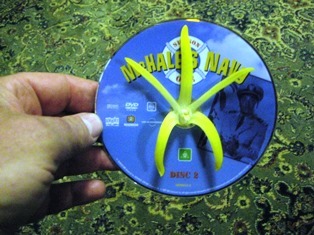 That is a full size CD the flower is sititng on . . . This cross will not disappoint. Grandisaurus was too good to just use it once. See description of it in cross 428. That’s it in the pic below. We make a wonderful couple! . Have a look at the pics and you will know how impressive it really is. Also, its a new blood line happening and that is what is needed on a continuing basis in the speciosum world . . . I like the name Gold Fire, glad I thought of it! Gold Fire is a new Top Shelf Parent as described in the cross 429 above. Kroombit Hero is another one I have decided to introduce into the nursery crew. This one is very much like Creek Aureum but a little darker I would suggest. I cannot see a problem at all with a grandiflorum looking like Creek Aureum; Can you? Just because it looks the same it may act in a totally different way. Expecting great things here once again. I always say that; do I not? But it is very true. I have too many great ones! Worth growing for sure.